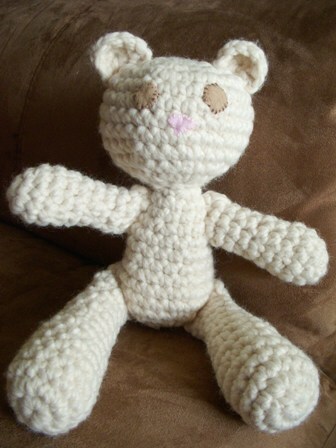 Here's the sixth bear I've made from the Beary Jackson pattern at Rheatheylia.com. I don't have the time or the patience to make baby blankets for all the babies in my life, so this is a great alternative that only takes me about a day. This time I went with a chunky yarn in an off-white (I threw away the yarn wrapper already so I don't have the name). I guess I forgot since the last time I made Beary that using a heavyweight yarn makes for a very large bear. I had to redo the head to make it smaller so I would have enough yarn to finish! I would recommend using no heavier than worsted weight yarn. My favorite yarn I've used so far was the Red Hearts Baby Teri I used on this bear. Unfortunately it's no longer being made and I haven't found a good replacement. I'm torn about how to do the eyes and nose on the bear. On this bear and the one before it, I embroidered on a fleece nose and eyes because it seems the less dangerous alternative to buttons or even safety eyes, which can easily be pulled out between loose crochet stitches. On the first bears I did the eyes and nose with embroidery only, which seems to work better on smaller bears. I'm not sure which option looks better.